One New Aftermarket Replacement John Deere Tractor Pioneer Hydraulic Conversion Coupler Kit that fits models: 7020, 6030, 5020, 4000, 4020, 4030, 4040, 4230, 4240, 4320, 4430, 4440, 4520, 4620, 4630, 4640, 4840, 3020, 3030, 3040, 3130, 3140, 2020, 2030, 2040, 2130, 2140, 2240, 2440, 2520, 2630, 2640, 2840, 2940, 1020, 1030, 1130, 1520, 1530, 1630, 1640, and 1830. Will work on all John Deere 30 and 40 Series Row Crop and Utility Tractors with closed Center Hydraulic Systems that use a one piece Cast Coupler Housing for each pair of Remote Couplers, or where Coupler Housing is part of the Selective Control Valve (SCV). Will also fit Late models 2520, 3020, 4020, 4320, 4520, 7020, and 7520 that use a one piece Cast Coupler Housing for each pair of Remote Couplers, or where Coupler Housing is part of the Selective Control Valve (SCV). PLEASE NOTE: Will NOT work with 10 Series or 20 Series Tractors with couplers mounted in separate square Housings. One Kit used for each pair of Couplers. 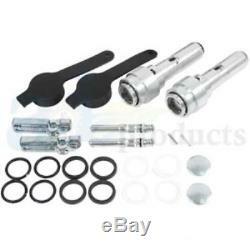 Converts Old Style John Deere Tractor Female Couplers for use with Standard ISO 5675 Pioneer-Style Tips. Only the 48 contiguous States in the U. The item "New Pioneer John Deere Hydraulic Conversion Coupler Kit 1530 1640 2130 2140 ++" is in sale since Tuesday, November 29, 2011. This item is in the category "Business & Industrial\Heavy Equipment Parts & Accs\Antique & Vintage Equip Parts".